I’ve been wanting to steam clean my nearly 20-year-old couch for a while now, so I was curious when Aldi advertised the Easy Home Hand Held Steam Cleaner as a Special Buy (ALDI Find). This steam cleaner doesn’t just do upholstery. The package also says it’s good on ovens, refrigerators, shower doors, toilets, tile, windows, floor boards, and more. It’s suitable for multiple surfaces, including glass, ceramic, stone, metal, and enamel. What makes this product appealing is that it says it cleans, disinfects, sterilizes, and kills germs using a powerful high-pressure team, with no need for chemicals or detergent. It cleans with good, old-fashioned water heated to a high temperature. It also claims to remove grime in hard-to-reach spaces. So, let’s see if the Easy Home Hand Held Steam Cleaner lives up to its promises. The steam cleaner includes 8 accessory pieces: an extension nozzle, angled nozzle, upholstery nozzle with cotton cover, window squeegee, round brush, extension hose, measuring cup, and funnel. It also comes with a user manual with warranty card, and it comes with a 3-year warranty and a phone number and website for after-sales support. It also includes a safety lock, child lock, and overheat protection. The manual runs through several pages of safety warnings. Use common sense, since this device mixes water with electricity. Don’t operate it while standing on a wet bathroom floor or anything like that. It also recommends wearing shoes to reduce body currents in the event of a fault. To start, I used the enclosed measuring cup and funnel to fill the hole in the top of the cleaner with tap water. The manual recommends using a mixture of tap water and distilled water if your local water is very hard. An oddity I noticed is that the enclosed measuring cup is marked with measurements and holds up to six ounces of water, but the manual says to put approximately 8.45 ounces in. Then I plugged in the steam cleaner (it requires a grounded, three-pronged outlet), saw a red indicator light turn on that let me know it was powered, and waited just a few minutes for it to heat up. It features a child safety lock that prevents the steam trigger from being pressed, and I locked it whenever I took a brief break while cleaning to make sure I didn’t accidentally spray anything or anyone with hot steam. Once the cleaner was fully heated, a green indicator light let me know it was ready to use. While the steam cleaner comes with an array of special attachments, many cleaning jobs don’t require them. The manual says not to use any adapter if cleaning a sink, toilet, fittings and drains, windows, furniture upholstery, window shutters, or mirrors. After cleaning, it says you can use the squeegee adapter to remove water together with any dirt it contains. Follow instructions in the manual if you are cleaning windows on a cold day; you must slowly warm the glass to avoid cracking. Also, the closer the steam nozzle is to the surface you are going to clean, the more effectively it will clean that surface. So get close. The manual also says that stubborn stains or dirt must be softened with water first. So, I started by tackling my old couch. I had enough water/steam in the steam cleaner that I also tried it on my kitchen back splash with tile and grout, as well as in my bathrooms on shower doors, tile and grout, tub, toilets and sinks, and I used it on bathroom and bedroom mirrors. I used the squeegee attachment for the shower doors and mirrors, and I tried the small angled nozzle for grimy areas in the corners of the shower. The area where I thought this steam cleaner did the most good was on my bathroom mirrors. It did a good job of removing those dried toothpaste splatters my kids get on the mirrors. I also liked how the steam cleaner performed on my kitchen back splash. Certain greasy, dirty spots looked slightly better after aiming the steam cleaner at them. I thought that I would need to allow some drying time after using this on my couch and other upholstered furniture, but it hardly got these things wet. I had to hold the steam cleaner very close for a long time over stubborn spots on my couch to even leave a small visible wet mark. Unfortunately, I wasn’t terribly amazed by the steam cleaner. It doesn’t seem very powerful. It makes a lot of steam and an impressive amount of noise, but I still had to physically wipe toilets, tub corners, and sinks to fully remove the visible dirt and dust. What’s also annoying is that the steam cleaner needs extremely frequent breaks to reheat. While cleaning full-length bedroom closet mirrors, I could get three full swipes from top to bottom with the steam cleaner, and then the green light would turn off, indicating that the cleaner needed time to reheat. I timed it, and it took 11 seconds after every three swipes for the steam cleaner to reheat to the proper temperature. It was the same with everything I cleaned around my house. I could get one small section sprayed, and then I had to stand and wait a few seconds for the green light to come back on. It adds a great deal of time to the cleaning process. I also initially found some of the attachments, such as the upholstery nozzle, to be difficult to attach, and the manual’s instructions for attaching it were slightly confusing. It took several minutes of fiddling before I figured out how to attach the nozzle. In fact, the manual is confusing on a few fronts: it says not to use any adapter if you are cleaning upholstery, but the box includes an upholstery attachment. It also includes a cotton cover for the upholstery attachment, advising that this can be used for cleaning “sensitive surfaces such as sofas and armchairs.” So do I use the upholstery attachment on my upholstery or not? The manual also states that if you set down the steam cleaner for a prolonged period of time while it is turned on, steam may escape even if you aren’t pressing the trigger, and it instructs you to “switch the steam cleaner off if you do not use it for a prolonged period of time.” That would be great, except there is no on/off switch. The steam cleaner automatically turns on when you plug it in. The closest thing to an off button might be the child safety lock on the trigger, but I don’t think that’s what the manual was referring to. In addition, the power cord is short, so I had to frequently move to different outlets throughout my house. If you attempt to clean something that isn’t near an outlet, you may need an extension cord. Also be aware that this device is not the same as a steam vacuum. It has no suction. It did a great job of blasting my old couch with hot steam and probably killed some germs, but my couch does not look any better than before. The cleaner did not remove visible dirt or stains, and I suspect a steam vacuum might do the job better. 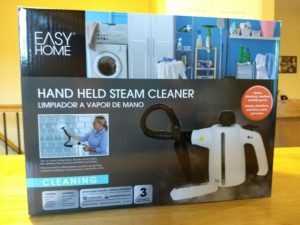 I had hopes that Aldi’s Easy Home Hand Held Steam Cleaner could do something for my nearly 20-year-old couch, and maybe help clean other things around the house. It did an okay job of loosening grime on my kitchen back splash and cleaning bathroom and bedroom mirrors. Unfortunately, the steam cleaner doesn’t seem to be all that powerful, requires frequent breaks to reheat, has a short power cord, and comes with a manual that is slightly confusing. I don’t often return products to Aldi, but this one may be going back to the store. Thank you so much. I’ve been trying for an hour and having all sorts of problems because there are no instructions. It’s definitely not worth more than $4. I paid 19.99 and will be getting that money back tomorrow. Thank you so much. I bought mine a few weeks ago but hadn’t got around to trying it. Your review backs up my suspicions so mine will be going back. Thanks for your time in writing the review. Yes DONT bother opening!!!! It’s a tea kettle essentially. All it does is create hot water lol! Had this for 2 weeks, used twice, not impressed. Now the safety cap that opens the vessel to be filled with water spins uselessly and does not open. Piece of trash. GJK, i used mine for a prolonged period today and the same thing happened. The safety cap does not come off. Unfortunately, i’ve had mine for quite a while, and don’t think Aldi will take it back. I wouldn’t be so sure. If you have a receipt (or even if you don’t) it is worth a try. I have never had any issue returning anything. Especially if you shop often and can find a staff member that remembers you. I just returned something that had no receipt and was purchased a few months ago. I did have the box still but have returned items in the past with no packaging! This is a great product for the price. I just recently started renting a townhome and noticed my dogs had a few accidents in one of the bedrooms. I used this on the automatic setting and it works great to get rid of the stain and smell from pets going to the bathroom in the house by accident. It is a great compact tool for small spaces to have to be able to spot treat and works best when used right after the accident happens. Thank you for your informative description. I too got it for small tasks, not to clean the entire house. I bought this and it stopped working towards the end of my cleaning on the first use. Actually, the steam started coming out where the hand nozzle is and burned my hand. Not sure if or how I can return it? Definitely too dangerous and no longer emits steam where it should. Very bummed! I haven’t used this steamer very long and it has already broke. The fitting on the tank broke, sending steam down the handle. The handle got very hot, very fast and almost burnt my hand. Oh good, I’m glad I’m not the only one! Got it yesterday – tried it several places – couch, sliding glass door tracks, just wasn’t impressed! I hope I can find my receipt because it’s going to go back! For those having trouble with the safety cap, please read the directions. It can only be removed if the steam pressure in the tank is less than 4.5 PSI. The cleaner is specifically engineered to behave this way as a safety precaution. If you try to remove the cap before letting the cleaner cool down, it will spin without releasing. The steam is hot…not scalding hot, but fairly hot. I’ve used it a few times so I can’t speak to its long-term durability, but so far, it works well for the mere $20 spent (half the price on Amazon for similar units), especially when used in tandem with my cordless hand vac to pick up loosened dirt and grime. I was able to clean my glass tables, mirrors, and window/sills with ease; no water spots! I also used it to sterilize my couch and jeans/sweaters between washes, though I can’t say how effective it is at that…they don’t really get damp from the steam. I may also use it to clean my car engine bay and interiors this summer. As the original reviewer stated, waiting for the steamer to reheat is an annoyance, but I don’t really think it’s a dealbreaker. I didn’t have any issues using the attachments either. Remember, this cleaner is not intended for removing years worth of caked-on grout and grime. If you want something with more power, then spend more money for that capability! I bought one of these, well, actually 2 of them, in April 2019. I am using them to steam clean food grease and cigarette smoke off a farmhouse kitchen’s walls and ceiling. I am pleased to say this appliance works like a MIRACLE! I installed the hose and the flat plate attachment on it, and steam portions of walls or ceiling at a time. I can actually see the point where the steamer has melted the grease, then I grab some paper towels and simply wipe it off. No tedious scrubbing, no harsh degreasers, the grease comes out of the bead of the beadboard, and the whole process is very fast. I did a 4′ x 8′ test area on the dirtiest part of the ceiling, and I am quite pleased with the results. I plan to try a sponge mop with some TSP solution on it first, to see if that will cut down the buildup top be removed with the steamer. I bought two steamers since I have such a large room to do, and these at Aldi are 1/2 the price of similar things on Amazon. The cord on mine is about 6′ or so. These also worked great to remove baked-on grease from an ’90s electric roaster. I am sure I will find many uses for these steamers. You people who want to steam clean upholstery: What you need is something like a Bissell Little Green Machine spot cleaner, or a Bissell floor machine like ProHeat 2x that has a hose + attachments. For upholstery, you want to not only clean but EXTRACT the dirt and the water, and you want to be able to rinse the soap out, too. This little steamer is more for hard surfaces. It’s too small to do something like a sofa. There probably are specialized machines for upholstery, but I had already bought the carpet cleaners so I just used them. You can actually clean upholstery with it. I used it on my couch and it did a great job. I followed this article’s advice. It did take some time, but all steam cleaners that are handheld typically take time to heat up after being used a few times.